I've tried everything I can think of and searched for answers online but so far nothing works. The laptop itself isn't great but should be more than powerful enough to run this game. I am getting the same error on startup. However, yesterday I was in the game with no problems. Now, I get the APPCRASH that you are experiencing. Hopefully someone has an idea about how to fix this. Has anything changed since the first time you played and today? Windows Update? Graphics Driver Update? Can you post or PM the APPCRASH you are getting? Navigate to your installation folder and try running SWGEmu.exe directly, do you still crash? 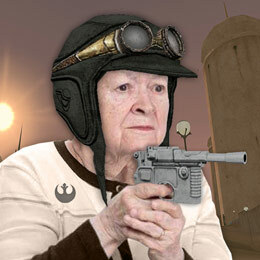 Try resetting your in game options by opening the launcher and clicking "SWG Options," then select "Reset in-game options." See if the game now runs. Hi Tyclo and thanks for responding! files before doing the scan. I hope this helps and thanks mucho for your attention and help! Ps... I loaded the copy I have here of your game onto an external hard drive to test the game on another computer I have but runs windows poorly .... the game ran on the other computer. First, I got the game to run on another computer; that computer barely runs, unfortunately. Second, I can get the game to run on this computer, from time to time; however, I experience game shutdowns which generate the above error message. I used the setup application to try different screen resolutions ( my monitor runs 1920 X 1080 ), with or without borders, with or without borderless windows ... sometimes the game gets past the character signin display, sometimes not. I also created a new character and the game ran ... then several minutes later the game shutdown, as before, and I am back to the character selection point and then it stops. I think it has something to do with my copy of Win 7. Yesterday, for most of the day, I repaired an older computer that had a trashed Win 10 on it .... after all the complete reset and new Win 10... I was able to run your server game without problems. I am looking forward to seeing you folks in-game!